First dentist I have ever enjoyed coming to! 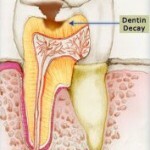 This happens when the enamel and dentine are repeatedly attacked by acid, producing a cavity. The plaque on your teeth contains millions of bacteria and they use the sugar in our diet to produce acid. 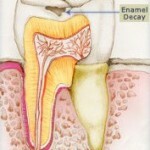 This acid starts to remove the hard minerals from the surface of the tooth, and generally last for about 1 hour after eating. After this time, the saliva in the mouth neutralises the acid and can remineralise (harden) the enamel again. However, if further food or drink is taken which contains sugar, the acid attack is repeated before the tooth has time to harden, and irreversible change will begin, which will result in decay. Everyone has sugar (or carbohydrates which are broken down to sugar) in their diet. To prevent decay, the frequency sugar containing foods are eaten must be reduced as much as possible – it is not the quantity of sugar taken each time. If you drink tea or coffee and take sugar 1 teaspoonful of sugar will have the same effect on your teeth as 4 teaspoonfuls (although you may put on weight with 4!!). It is better to stop sugar or use sweeteners instead. As there is usually sugar in some form in most meals, it is better to try to limit the intake to the three main meals each day, which gives the teeth time to recover from the acid attack in between meals. Drinks in between meals should be still water, milk, tea or coffee. If you need a snack in between meals, choose foods that do not contain sugar e.g. cheese, raw vegetables, nuts, breadsticks. Children invariably enjoy eating sweets, and it is unrealistic to stop them eating them. It is better to let them have sweets once or twice a week (after they have had their meal) and let them eat all they want for the next 1/2 hour, followed by tooth brushing.